Bark River’s Donnybrook every day carry knife could prove useful as a defense weapon or a working tool. But the strongpoint might be how handy the knife is to carry. The Donnybrook is a handy knife, and its small size means it will be convenient to carry. I don’t know diddly about knife fighting, and have little inclination to learn. Statistically, knife fighting is one of the rarest forms of combat. Also, some 30 years of active and continious training in Teakwondo made me reasonably proficient in that form of unarmed combat , as well as exposing me to training in nunchuku and bo staff. I studied hard, and learned enough to detect, assess and flee at the first hint of a physical confrontation. So a fighting knife is not on my radar. 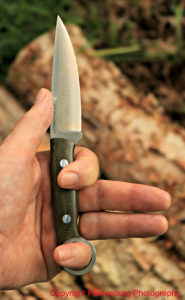 But the Donnybrook, according to Bark River, is an EDC knife that could be a fighter. I carry several knives every day, and my EDC belt knife is the one that will end up doing the most work. So the Donnybrook rode on my hip when I went fishing and planting aezelas in my front yard. It has been used for several weeks as my do-everything knife, and it has performed well. Here are the Donnybrook specs, courtesy of Knivesshipfree.com. The handle fits my large hands well. The ring assures your hand won’t slide off the handle when it’s wet and slippery. The ring thing on the handle: Skeptical at first, I find myself liking it. In reverse grip, the first finger lines up with the ring, and in forward grip, the little finger lines up with the ring. Put your pinky through the ring and you get a solid hammer grip. There is no danger of your hand slipping up onto the blade, no matter how slippery the job gets. The index finger can go through the ring for another grip. You can also use the knife quite handily without putting a finger through the ring. For a big game hunter, the Donnybrook could be an excellent choice for the messy, inside the abdominal cavity work, where you might have to operate by feel. The ring prevents any slippage, and there is no danger the handle might turn in your hand. This knife could prove to be a pretty fair caper for the trophy hunter, and useful for the initial under-the-tail work of field dressing, and for skinning around the neck and shoulders of a whitetail. Steel: CPM-154 is a favorite of mine. It holds an edge well and is easily sharpened. Handle: I have large hands and handles less that four inches long generally don’t work for me. The Donnybrook’s handle measures right at four inches. Without the ring, I would not be able to use this knife safely. I would prefer a thicker handle on the knife, since, in my experience, a large diameter handle reduces hand fatigue over long term use. As is, because of the ring, I can use this knife safely. 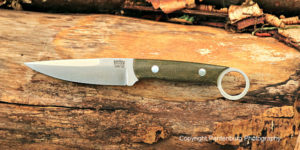 I ordered my Donnybrook in green micarta, as a nod to my Irish heritage. Point: The sleek blade is very pointed, and is apparently designed for thrusting. It has a swedge, which helps make this a better stabber. There is virtually no belly on the blade, so this wouldn’t be a good choice for a dedicated skinning knife. The Donnybrook’s point would be a good choice for a bird hunting knife. Grind: All Bark River knives are convex ground. After extensive experimenting, I have come to prefer a convex grind over all others. Convex is easy to sharpen, once you get the hang of stropping. Sheath: A sturdy leather sheath is included. I like it, but added a D ring to make it a dangler. In a knife like the Donnybrook, having a horizontal carry option would be a good idea. Horizontally carried, under a coat or long shirt tail, the knife would be virtually invisible. Weight: At 3.125 ounces, this knife is barely noticeable. I wore it on my belt and forgot it was along. This would be a great rigid blade knife for a backpacker, or anyone who has to reduce pack weight. Do you need a Donnybrook? I was surprised at how handy the Donnybrook is. The knife is lightweight, and easy to carry, and I’ve found it to be really handy. If these are things you search for in an EDC knife, the Donnybrook is a good choice, and worth looking into.